We all know what an anchor is - a heavy metal hook used to secure an object, such as a boat, so it won't sink or float off to sea when it isn't supposed to. The anchor, when hooked to a sturdy rock, provides support, stability, and security for the boat. 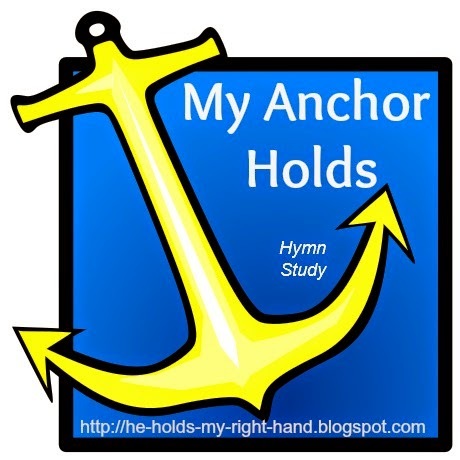 In this hymn, my anchor is a symbolic picture of Jesus Christ who, when we are attached to Him, provides the same type of support, stability, and security in our lives, especially in the midst of dark and stormy seas. When the angry waves (Satan and his demons) are trying to cause us to shipwreck, we can be at peace, knowing our Anchor will give us the support we need to remain intact. He is there to help us in our time of need. But, remember... it only works when we are ATTACHED to the Anchor. Are you attached to Him? Are you trusting in the only One who can keep your boat secure? If not, I encourage you to take that step of faith today.